Tile Countertops – Are you looking to install tile countertops? 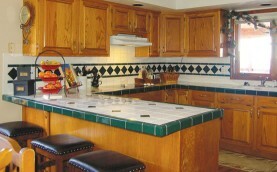 Tile countertops are most often found in either the kitchen or bathroom. 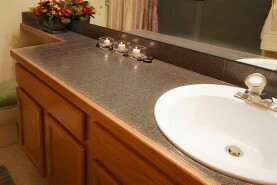 Tile countertops are very durable and are available in a variety of colors and textures. Ceramic or porcelain tile should be used on countertops because they are more durable and less porous. Consider using lighter color tile in a matte finish, so scratches are not as noticeable. 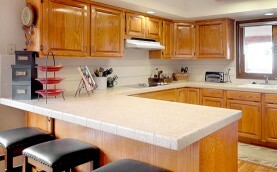 Before installing tile countertops, consider refinishing your existing countertops. Refinishing is a green remodeling alternative that will save you a significant amount of time and money over installing new tile countertops. This refinished tile vanity now looks modern! the look of a total makeover! Tile Countertops – Do your countertops need to be repaired or replaced? If your tile countertops are chipped or scratched, they can most likely be refinished instead of replaced. Chips and cracks can be filled, repaired, and refinished so well that the tile will look like brand new. Is your tile grout stained? The grout lines in tile countertops are very porous. Grout should be sealed when it is first installed and periodically sealed thereafter. If water does not bead up, then it’s time to reseal the grout. Unfortunately, once grout becomes stained, it is almost impossible to get it clean. A major advantage of tile refinishing is that the process completely seals the grout lines, making the grout lines very easy to maintain and keep clean. Tile Countertops - How much can I save by refinishing? Whether your tile countertops are damaged or need replacement, countertop refinishing is almost always more affordable and less hassle. Refinishing can save up to 75% of total replacement costs. Not only is refinishing less expensive, but it is also faster. Replacing a tile countertop will involve messy demolition and expensive tile setting labor. Demolition and replacement will take days, if not weeks to have your kitchen back. With refinishing, you can typically use your kitchen for light duty within 1-2 days. 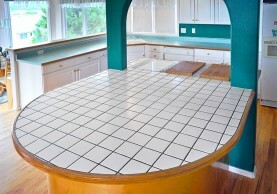 This refinished tile kitchen island updates the look of this kitchen! 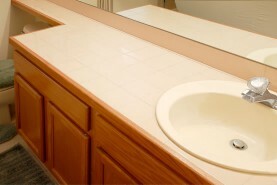 Tile Countertops - What are the advantages of refinishing? Just as countertops vary in material composition, tile countertops have certain advantages and disadvantages. Tile Countertops - How do I find a professional tile refinisher? Refinishing is not a Do-It-Yourself project and the best results come from a professional refinisher. 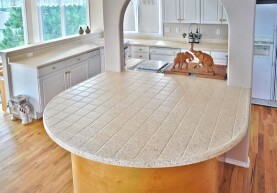 Professionally done, your tile countertops will look and feel like new. Click on Find a Location or call our toll free locator number, 1-888-271-7690, for a free tile refinishing estimate from a Miracle Method professional.